Paul Paulin (1852 - 1937) was born in Chamaliers, France on July 13th 1852. He was a dentist by profession but was a great admirer and student of the arts. This admiration led him to model and cast in bronze portrait busts of several of the most famous French artists and notables of his time. Among his most recognized portraits are Renoir, Degas, Monet, and Queen Victoria of England. 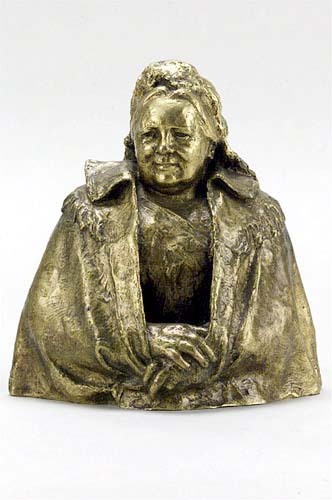 Paulin exhibited his bronzes at the Salon des artists Francais from 1882 to 1889 and starting in 1901 he exhibited at the Salon des Beaux-Arts. An exhibition of Paulins works took place in 1983 in Clermont-Ferrand, France. This was the largest showing of his works ever assembled in one location. The bronzes came from many museums throughout France as well as works held in private and corporate collections from all over the world. A fine portrait bust of this famous monarch, Queen Victoria would be enjoyed by any British history fan. There is currently a popular PBS series on her life titled "Victoria". This bronze was cast by the Valsuani foundry in 1901.